The dictionary defines ‘alternative ’ as ‘departing from traditional practices ’ and ‘different ’ as ‘new and unusual ’. We're interested in what it means to you to have a wedding ceremony or day that’s alternative? The world's love affair with Scotland continues, and we suspect it always will, as Scotland lends itself so well to offering a multitude of stunning backdrops and quiet tucked away corners to entice you to get married or renew your vows here. You might feel drawn to Scotland for a variety of reasons. Maybe you have Scottish ancestry? Maybe you've been to Scotland before and have fallen in love with its lush green landscape and lochs? Or maybe you've read books or seen films or a series that are set in Scotland? Some of the sentiments we're read and seen in the books and films have inspired us to create 'Themed' ceremonies to offer couples, for instance, Outlander, Braveheart and Game of Thrones all have beautiful handfasting rituals that can't fail to move and inspire. Below you'll find some ideas for making your ceremony alternative. 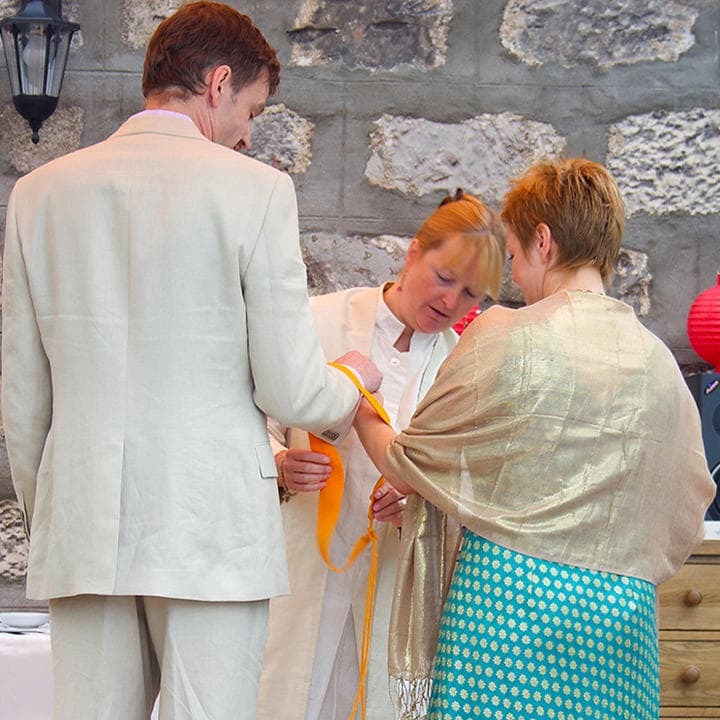 Ritual can be used to great effect to create an alternative ceremony. The most popular rituals are handfasting, sharing a drink from a Quaich, candle lighting and sand pouring, and we know of several versions of each which can be adapted to take into account whether or not you have guests, and what would feel meaningful and memorable for you. There are also many other Celtic, quirky, fun and memorable symbolic gestures you might consider including. It’s very hard these days to come up with something completely new – most things have already been done – but just because something has been done before, doesn’t mean that you can’t feel inspired to create your own unusual or unique version of something. And we are here to help you do that. Perhaps your wedding is alternative because of the location, or the dress code or theme, or perhaps you’ll have lots of people with creative roles? Whatever it means to you, we can offer you a ceremony that both speaks to your hearts, and is engaging for any family or friends in attendance. Define Marriage in Your Own Unique Way? We encourage all couples who’d like to, to come up with their own definitions of marriage or commitment or togetherness. We’re interested in hearing what being together means to you both now as you decide to marry and take your relationship to the next level, and also into the future. We invite you to have as much input as you wish to in your ceremony. We support you to define your own personal beliefs if beliefs are important to you. We don’t try to convert you to our beliefs, or fit you ‘in a box’ or insist you agree to include wording or symbology you don't like or agree with as a condition of us marrying you. Whether you consider yourselves non-religious or religious, spiritual or atheist or humanist, or anywhere within the vast spectrum of beliefs in-between we can help you as we take into account your beliefs whatever they are. 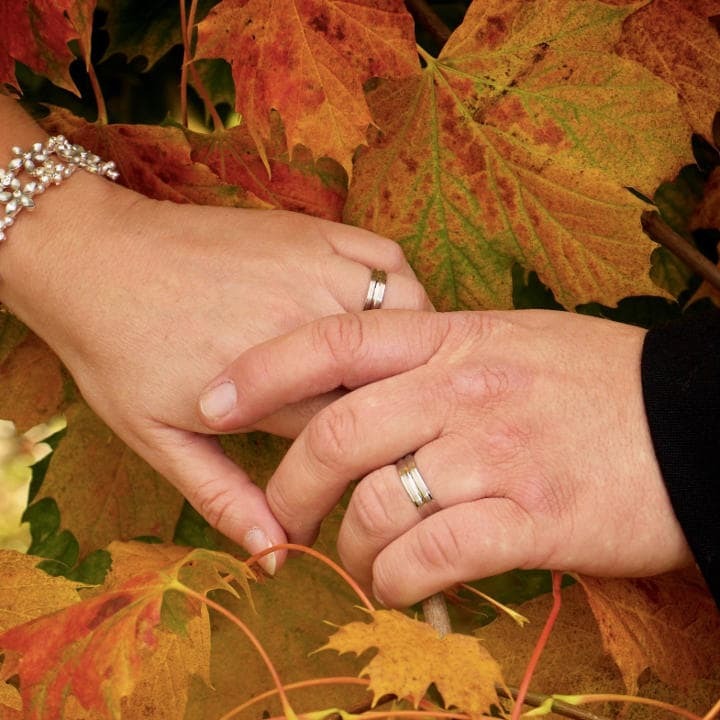 We create your ceremony in a way that fits both your beliefs and those of any family/friends present too. We offer complete freedom and flexibility with every aspect of your ceremony. We don’t tell you what you can or can’t have – we extend an invitation to you to tell us exactly what you’d like (giving suggestions as needed), giving you the freedom to choose every aspect of your ceremony from atmosphere, to length, and whether it’s to be creative and alternative or include some elements of tradition. We love to celebrate love, we love to celebrate difference and we love to honour tradition - everything has its place. We have yet to be asked to include something in a ceremony that we felt uncomfortable with. You have our assurance that only those elements that mean something to you will be part of your ceremony – nothing more, nothing less, nothing else. You have our absolute word and guarantee that your ceremony on the day will be only and exactly what you’d like and need; to ensure this we ask you to read and approve your ceremony beforehand, then we make any changes needed. And for some ideas . . . In the hugely popular Outlander books by Diana Gabaldon, the relationship between Claire and Jamie Fraser forms the central story line. The wording of their marriage vows is beautiful and the values they share and choose to base their relationship on are hugely inspiring for any couple to consider. 'Visit Scotland' have had to open up a whole new department to deal with Outlander Tourism. Whether you'll take part in an 'Outlander Tour', or create your own tour, we'd love to help. Much of the story is set in Scotland, with Diana Gabaldon having been inspired by Inverness and The Highlands - Castle Leoch was inspired by Castle Leod, the actual seat of Clan Mackenzie. 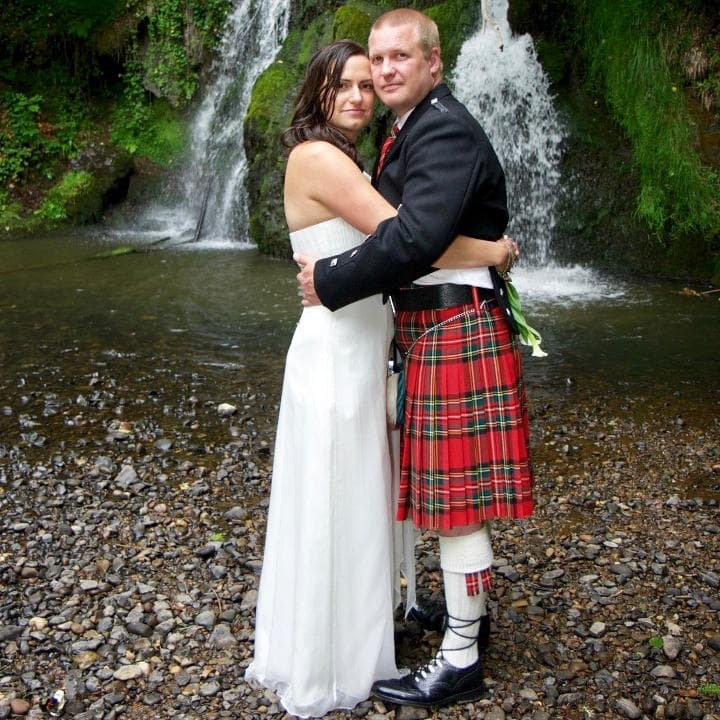 When Eric and Nicole decided at the last minute to spiritually marry whilst on a trip to Scotland we pulled off their Outlander ceremony at just under two weeks. Bravely they included the blood oath as part of their vows. Hundreds of couples have already been inspired by the handfasting ceremony that took place between William Wallace and Murron in the film Braveheart. 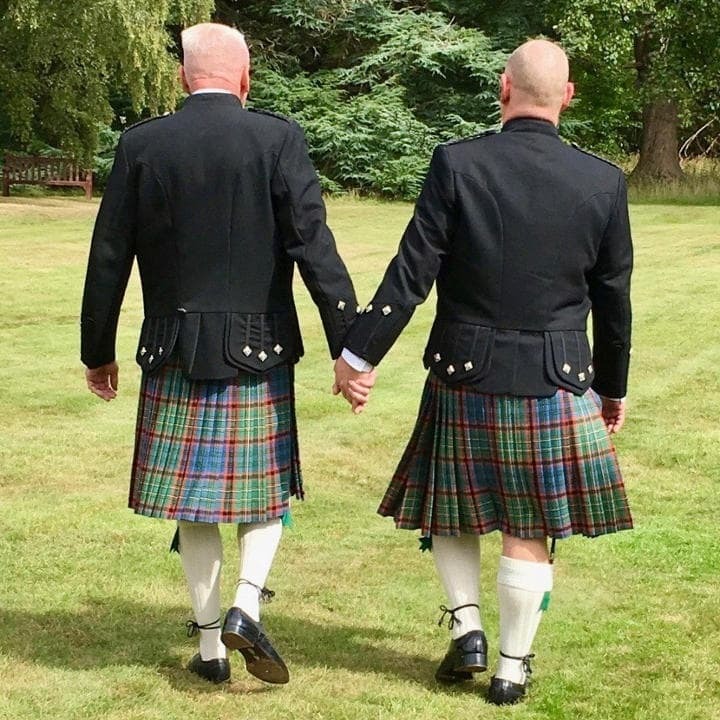 The tartan and thistle handfasting is a very popular ritual. The soundtrack is also hugely popular too. In the Highlander film whilst there's no wedding as such, still the depth of love shared by Connor and Heather MacLeod is deep and devoted and we can imagine they were handfast. Eilean Donan Castle (pictured) is Scotland's most photographed castle, and features in the films Highlander and Maid of Honour. The castle is open to the public, but at the end of the day there’s a window available for you to get married there. We can tell you about the castles we know and love. The beautiful beaches of Arisaig on the west coast were featured in the film Local Hero, as was the village of Pennan on the Aberdeenshire coast. Scotland is not short of spectacular beaches. James Bond's family home 'Skyfall' was in Glencoe - the story has it that James Bond was half Scottish. The stunning scenery which creates the backdrop for the shots of the journey to Skyfall in the film of the same name are the peeks of Buachaille Etive Beag and Buachaille Etive Mor not far from Fort William and Oban. Again you could get married in the great outdoors, or you could research online to find a suitable venue nearby for you and your guests. "My luve is like a red, red rose"
Burns came from Alloway not far from Glasgow, so if you feel inspired to literally follow in Burns' footsteps, Jane would be ideally placed to hold a ceremony for you. There is so much inspiration in life and we have dozens of ideas for your ceremony and invite you to share your ideas with us - we have further 'Themed' ceremonies inspired by Neale Donald Walsch's 'Uncommon Wedding Vows' which include a rose ritual. Kahlil Gibran's words on love and marriage create a beautiful wedding address, and then we have Buddhist, Christian and Quaker influenced ceremonies to name just a few more 'Themes'. But if you are inspired by the teachings of Eckhart Tolle, or Robert Holden, your ceremony can include some of their wisdom. Let us know, and in the meantime here are some examples of ceremonies that could be said to be ‘alternative’ each in their own way. How About A Wedding Walk? Lulu and Paul’s wedding was very different because it was at their house and along the riverside close by. Whilst Lulu enjoyed attending other people’s weddings, when it came to her own, the traditional format didn’t appeal at all. She didn’t know what to do and consequently did nothing even though she and Paul wanted to get married. Once she discovered she could have an alternative ceremony anywhere and anyhow, she finally got excited and started to dream into what she really wanted. What she would really love, she said, was to walk along the river with her children and dogs, just like she does every day. Being able to walk that familiar route would be just perfect, and she and Paul, the children and the dogs, would lead their guests from the garden of the family home and back again, in a circular route with three stop offs on the way. On the day it rained but we donned colourful umbrellas, and after the welcome and introduction in the garden, we set off along the road a short distance, and down to the river. We had to walk single file along the path in some places, and scrabble down some steep bits to get to grassy flats near the water’s edge. We enjoyed a reading in one place, the wedding address in another, then Lulu and Paul made their vows in a beautiful walled garden. We followed them home for the final words and a sand ritual with the children. It was a bit of a soggy day, but it didn’t detract from the relaxed and fun feeling and the engagement of the guests who loved being part of something different. The biggest challenge was keeping Will’s cameras dry as he tried to capture the day – not the easiest of circumstances with everyone on the move and the rain. Gunda and Axel were lucky with the weather for their day. They held a very small legal civil ceremony in Germany with ten of their closest family and friends, then on their first anniversary they had a very sacred spiritual ceremony as one part of a whole day of celebration. They opted for a ‘Design Your Day’ package and to prepare we not only discussed the content of their ceremony, but we discussed what ‘add ons’ would help them to have the most wonderful, relaxing, memorable day, all about the two of them – honouring their beliefs and interests and passions. We began their day with some prayer and meditation in The Nature Sanctuary at The Findhorn Foundation which was where their ceremony was scheduled to take place in the afternoon. Following this they took an hour’s walk down to and along Findhorn beach. We went on ahead of them to set up on the beach. We lit a fire and laid out a picnic brunch. Following this Gunda and Axel returned to their holiday cottage and got changed into some very simple white outfits for their ceremony. Their ceremony was very personal to them and included dances (they met during a dance workshop), personal vows, and an altar to the four elements with a different ritual at each point. After the ceremony and some more photos, a celebration drink and a New York cheesecake (their choice of cake!) helped keep them going until dinner. They returned to their holiday cottage again for a rest and to change into their wedding day outfits, and then headed to a Michelin star restaurant for dinner. So they combined their love of the beach and the outdoors and nature, their love of (particular) food, their love of ritual and dance, their enjoyment of dressing up, and their spiritual beliefs. Their day was very relaxed with a loose schedule and they loved that they only had themselves to please! Taking place in the very beautiful and traditional setting of a castle the ceremony was to take place in front of the fireplace in the state dining room. Guests were to be seated and there was a choir to lead the singing, and though they didn’t have roles and stayed seated during the ceremony, there were four bridesmaids and four groomsmen all looking wonderful in elegant dresses and kilt outfits respectively. What was different was that Linda and Brad had their first glimpse of each other and their outfits in a private moment at a ruined kirk in the woods in the grounds of the castle. At 2.30pm Brad waited there with his bestman and the photographer, and Linda walked through the woods and up to the kirk. Brad and Linda were able to spend a little time together on their wedding day just the two of them without worrying about their guests, and they had their very relaxed couple shots – before the ceremony! Turn The Timing On Its Head! They then joined their 100 guests of family and friends for a drinks reception at 4.30pm – this is when guests were invited to arrive. At 5.15pm guests took their seats for the ceremony, and at 5.30pm Linda and Brad made their entrance together – they’re a couple who believe that their marriage is a partnership of equals, and as they’d seen one another already, as had all their guests, they made a statement in this way. Also because Linda’s father had passed on, it felt more fitting for her than going with a traditional entrance with someone else escorting her up the aisle – for her that would have too strongly highlighted his absence. Following the ceremony Brad and Linda had organized a pipeband to play as a surprise to the delight of their guests. Guests were stood outside the castle having a celebration drink after the ceremony when we could all hear some noise in the distance. The band then appeared over the hill and marched over to us. So some very traditional aspects woven together beautifully with some very different choices. Whichever traditional aspects you love, and whichever different aspects excite you, why not weave them together for your perfect day? We design ceremonies of all shapes and sizes, all visions and budgets, to suit couples of all shapes and sizes! No ‘cookie cutter – one size fits all’. If you're interested in hearing further ideas for 'Themed' ceremonies, or ‘Design Your Day’, or ‘Design Your Stay’, please give us a call or drop us a line.